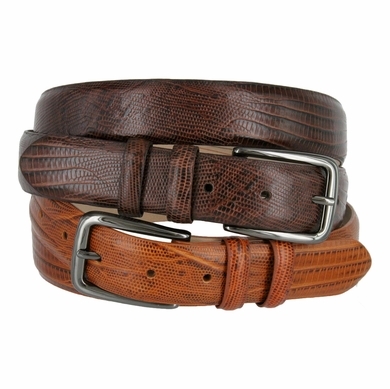 Classic Sleek gunmetal finish buckle with supple Genuine Italian Calfskin Leather belt. Double matching color and pattern leather keeper. 1-1/8"(30mm) wide and available in colors: Alligator Black, Alligator Brown, Alligator Tan, Alligator Grey, Alligator Navy, Lizard Black, Lizard Brown, Lizard Tan, Smooth Black, Smooth Brown, and Smooth White. Sizes available: 32"(81cm), 34"(86cm), 36"(91cm), 38"(96cm), 40"(101cm), 42"(106cm), 44"(111cm), 46"(117cm), 48"(122cm), 50"(127cm), 52"(132cm), 54"(137cm). Sizing: Measure around where you wear the belt, with your pants on, and order closest to that size.